Heat the milk in a heavy saucepan over medium heat until hot but not boiling. Lower the heat and add the farina, pouring it in a thin, slow stream and whisking it steadily. Continue whisking until it forms a thick mass on the whisk; this will take 3 to 5 minutes with regular farina and about 2 minutes with quick-cooking farina. Remove the saucepan from the heat, and add the Parmesan cheese, 1 tablespoon of the butter, salt, and egg yolk. Whisk rapidly to avoid coagulating the egg, until all the ingredients are well blended. Lightly moisten the bottom of a 9-inch pie plate with water and spread the farina mixture in it, using a spatula or broad-bladed knife to smooth it to an even thickness of about 1/2 inch. Refrigerate the mixture until completely cooled, about 30 minutes. Note: You’ll find farina, which is also called cream of wheat in the warm cereals section of the supermarket. Cream of wheat comes in instant, quick cooking, and regular varieties. Use the quick cooking or regular, not the instant for this recipe. Note: To toast walnuts, spread on a rimmed baking sheet, and roast on center shelf of a preheated 350 degree oven until lightly browned, 5 to 8 minutes. Remove and cool. 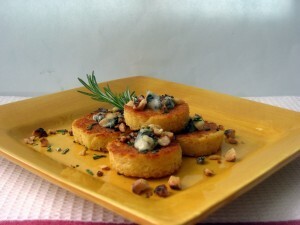 This entry was posted in 2011 Recipes, Appetizers, Recipe Pantry, Vegetarian and tagged farina, gnocchi, gorgonzola, rosemary, walnuts by brosbottom. Bookmark the permalink.